As early as 793 AD Münster played an important role in the region and Charlemagne had sent the missionary Ludger to evangelise the Münsterland region. He became the first ordained bishop of Münster and the first cathedral was completed in 850. Due to its location at the river Aa and near the river Ems it was an important ford and crossroads for traders between North and South. In the Middle Ages it was a leading member of the Hanseatic League, a commercial and defensive confederation of merchant guilds and their market towns that dominated trade along the coast of Northern Europe. 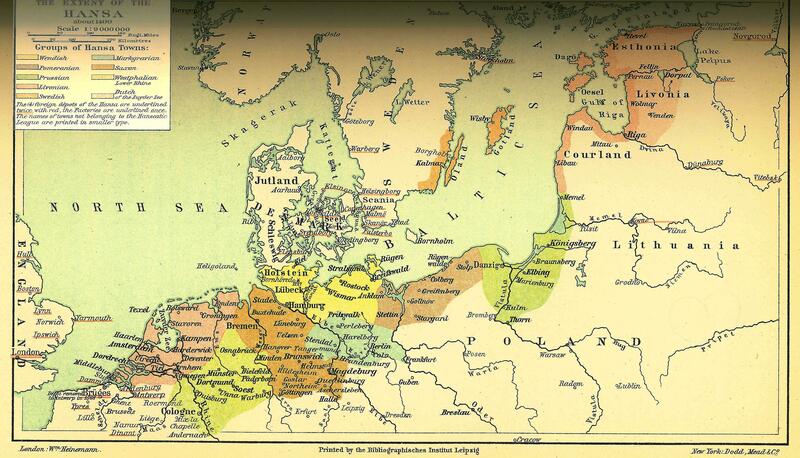 It stretched from the Baltic to the North Sea and inland during the Late Middle Ages and early modern period (13th–17th centuries). In the treaty ending the Thirty Years’ War one article declared the region to be exclusively Roman Catholic which had dire consequences in modern times: during the 1940’s Cardinal Clemens August Graf von Galen was one of the most prominent and outspoken critic of the Nazi regime. In retaliation for his international fame and success the city was heavily garrisoned during the war. It became the home of a large number of corps, infantry and tank divisions and controlled military operations in the northern part of Germany at that time. This in turn meant that it was heavily bombed and attacked in ground assaults by the Allies. About 91% of the Old City and 63% of the entire city was destroyed by Allied air raids. In the 1950s the Old City was rebuilt to match its pre-war state, though many of the surrounding buildings were replaced with cheaper modern structures. It was also for several decades a garrison town for the British forces stationed in West Germany. In 1780 the University of Münster was established and now as the Westphalian Wilhelms University determines the character of the town: a student town if there ever has been one! Its bicycle friendliness is well known and adds another special touch to the atmosphere. 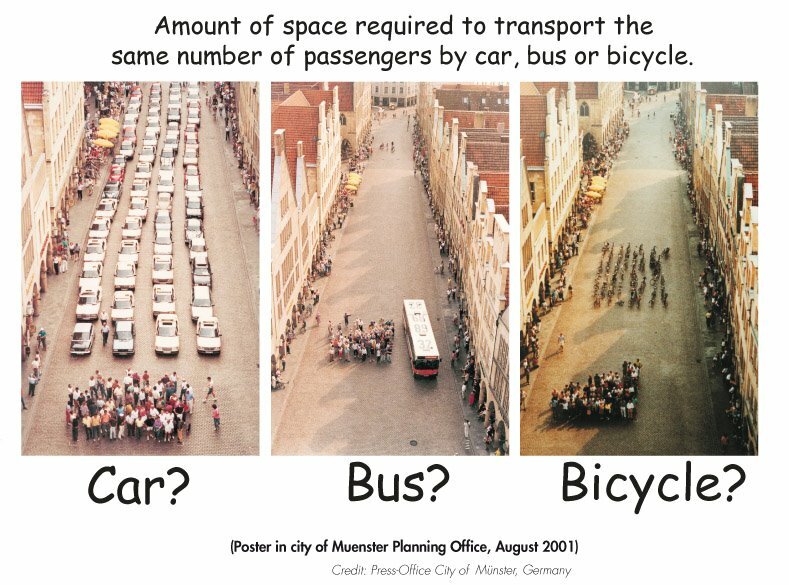 According to the city’s web site Münster is home to 500,000 bikes, which means theoretically each inhabitant owns at least two push bikes!!! Enjoy your stay with your local guide showing you all the special hideaways and treats on your Western Contrasts – Border hopping and Industrial Heritage tour, giving you a taste of relaxed living in northern Germany. The private museum was founded in 1902 by Karl Ernst Osthaus and in 1922 merged with the Essener Kunstmuseum (1906) to become one of the most significant museums for modern art in Germany. The name “Folkwang” is derived from the name of the afterlife meadow of the dead presided over by the Norse goddess Freyja. A meadow for modern dead artists and their art! During the Nazi regime about 1200 pieces of art were removed under the purge of degenerate art. Most of them were sold to overseas bidders to raise cash. Those they couldn’t sell were ultimately burned. The Museum Folkwang and the other museums affected have generally not tried to reclaim these works because at the time, the removal and sale of the works of art were legal under German law. The works of art were ultimately the property of the German government, which had the legal right to dispose of them as it saw fit. In 2006 the Krupp foundation solely provided the funds for building an extension and in 2007 David Chipperfield won the contest. The new buildings were opened in 2010 and provide a modern addition to the original spaces. Nowadays the museum maintains a leading role in Germany’s art scene by awarding scholarships and offering a variety of exhibitions and activities aimed at curating modern art and inspiring future artists. The museum’s English web page has more details regarding future and past exhibitions. To understand the significance of this particular boat lift, you need to know that at the end of the 19th century the Ruhr region was such a major manufacturer of products, that the railway system could not handle the loads anymore. Where natural rivers fell short of the requirements they either got modified or bypassed with canals. For ships to be able to travel these waterways in both directions they needed boat lifts capable of operating with these large transport ships. One of these canals, Dortmund-Ems Kanal, connects the sea port Emden with the inland port of Dortmund. And the Henrichenburg lift is the last one before Dortmund port. The lift bridges a height difference of 14 metres. The canal and the lift were opened in 1899 and despite heavy attacks during WWII it was operated until 1962. See here for more technical details regarding the innovative lifting techniques. To be competitive a new lock and lift was built and used until 1989. By then ship building technology had again advanced to such a degree that the lock and lift were too small to cater for the ever increasing cargo ships. 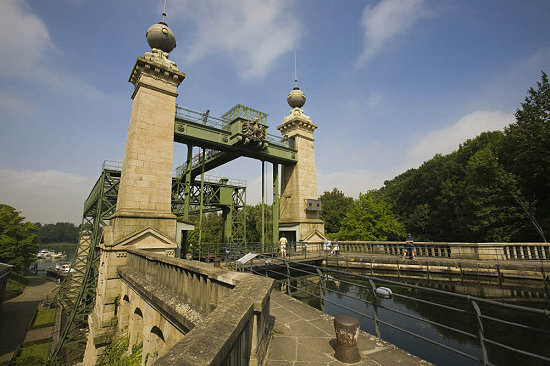 Another lock and lift was built, but it had to stop work in 2005 due to technical problems. In 1979 Henrichenburg lift became part of the Westphalian industrial museum and now houses exhibitions and ships detailing its history and relevance to the development of the region’s economy. Today the canal region has become quite recreational. Bicycle routes and walking tracks along the banks of the canal make it easy to explore the industrial heritage of the region. This is just one of many interesting industrial heritage sites we visit on our Western Contrasts – Border Hopping and Industrial Heritage tour. 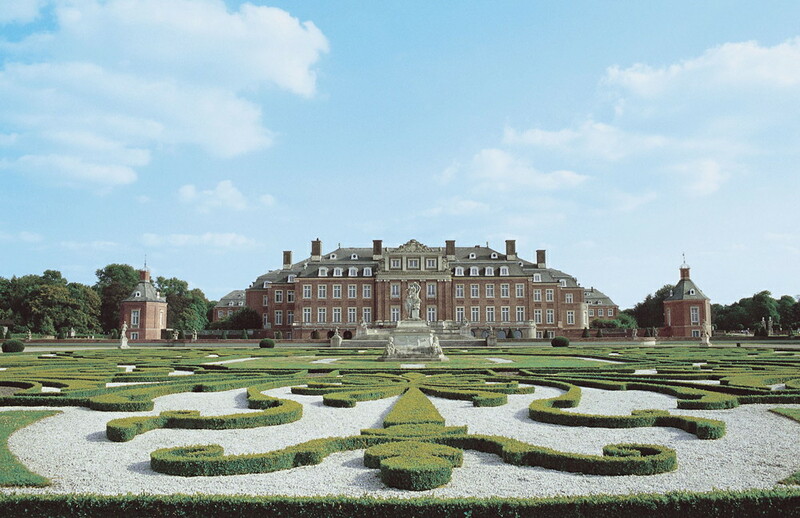 This particular bike tour circles the whole Münsterland region and is divided into four individual trips – North, South, East and West route. Each route covers between 210 and 310 kilometers. As these can be a bit too long for a casual day trip, the regional bike path system offers short cuts around the circuit. The tracks are off the beaten path, offering safety and tranquillity to enjoy the landscape and castles. The ADFC (General German Bicycle Club) gives ratings of tours and this particular one has a 4/5 star rating! The tour might be called 100 castles, but in reality you can see more than that. Due to the abundance of historical castles, palaces and monuments, the tour guide books / pamphlets limit their descriptions to the minimum of must-see landmarks. Below map shows the four routes and also which of the sights are absolute-must-see (in red), must-see (in dark green) or just plain interesting (light green)! Even though the city was first mentioned in the 9th century it was just a conglomeration of farms. It took another five centuries before it became a city. By then it had become a major trading town and had its own judiciary and government. Up to the 13th century there had been constantly conflicts between the bishops and the local knights, where the bishops tried to incorporate their lands. During one of these conflicts, 1308/9, while the bishop’s seat was not occupied, the knights declared the region a city. This declaration though was not officially accepted and the city’s representatives were not allowed to go and vote in the Landtag, state parliament. For how long this unofficial state continued is unsure, but in 1804 the city was finally declared county seat for the Lüdinghausen district! The city is situated in the Münster region and can boast a range of castles in its vicinity: ranging from earliest defensive estate (Castle Kakesbeck) to Middle Ages design (Castle Vischering) to Renaissance castle (Castle Lüdinghausen). As befitting a region dominated by waterways and not mountains: cycling is BIG here! The city has devised an extensive sign and numbering system that lets you easily plan your day trips. Pick a sight to see and just follow the number! As the signs and the descriptions are in German though, it pays to consult with / follow your guide on your Western Contrasts – Border Hopping and Industrial Heritage tour.